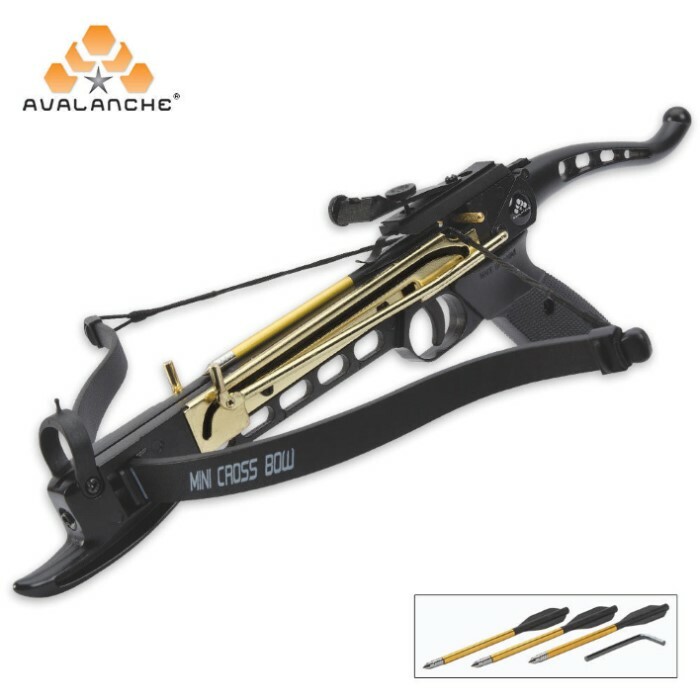 Measures approximately 18" x 6"
You can rocket crossbow bolts up to 160 feet per second or 100 yards with this top-quality Avalanche Cobra self-cocking crossbow. 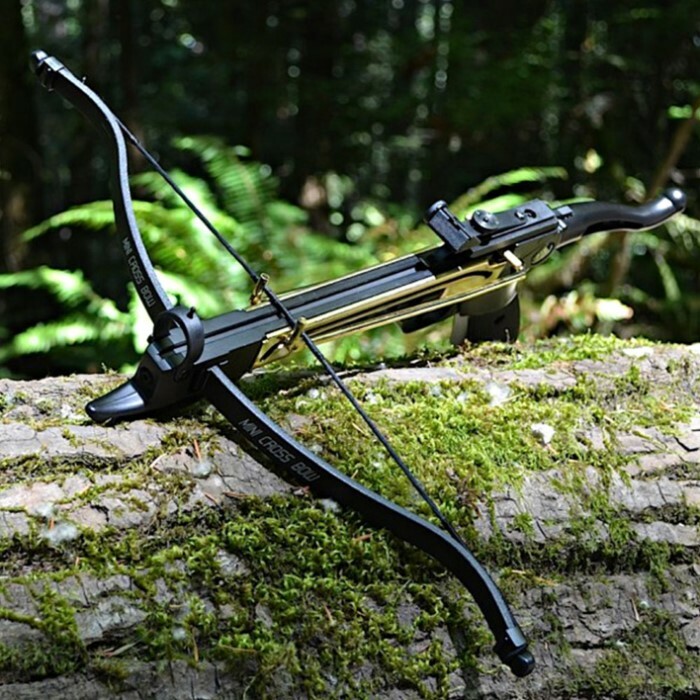 This crossbow has a pistol grip handle that gives it a premium feel, and the self-cocking design makes it super easy to use. 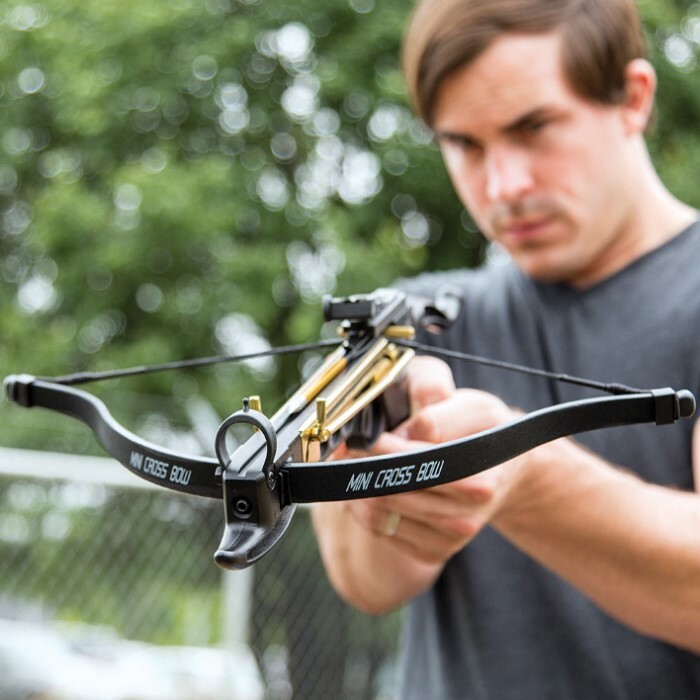 It has lightweight but sturdy fiber graphite limbs and die-cast and brass-plated construction usually seen in much more expensive crossbow models. You can fine tune this crossbow to your personal specifications using the click tune sighting, windage and elevation features. It also features an automatic safety and comes to you with three 6" aluminum arrows so you can get busy with target practice. Wow ! Definitely Not a Toy !! Adult Supervision Required ! BUY a stringer, it is a pain to string it otherwise. I finally used a 1" Ratchet Tie-Down to draw the bow down to get the string on it. Then I waxed the rails and waxed the string before firing it. Performed Awesome ! For lack of a target, I ambushed a 5-gallon plastic pail full of water. The sights factory setting were about as perfect as you would get. The unsuspecting pail had a 6-inch slash in the front. The arrow did not go all the way through because of the water. Yup, I am impressed with this little jewel. NO broken arrows, it exceeded my expectations and I just ordered additional wax, 48-Pack of Arrows and 3 more strings for the long haul. I suspect with routine waxing the rails and string, I should get good service out of it. A drop or two of oil on the trigger mechanism, before I shoot it again and its good to go! 5-Stars !! I highly recommend this one for any wild game that's within range, its a pretty powerful little crossbow. Just attach it to the outside your Bug-Out bag and you're good to go. I'm Never disappointment with CH Kadels. Have this and tested and reviewed it. It is fine for the designed purpose of acquiring small game animals. It does take practice, but it is fun. I would buy extra bolts as well. Great little crossbow for the price. Slap a 30 dollar red dot sight on it and get it sighted in and you are good to go. I would like to remind you to keep bow string wax handy and buy an extra 3 dollar string for backup. It's a very lethal crossbow don't be fooled by it's size. I just got my crossbow in the mail and after a little assembly and pathetic attempt to string by my self with just arm strength I got to see just how awesome this thing is. Thank you BUDK for giving this to me and I can't wait to see the next BUDK by request. I had one and these are the best ! I would buy another. The effective range is about 25' -cannot promise a accurate,lethal blow after that. This setup would be awesome if it was a 120 lb.pull w/an aluminum arm for the cocking system! The crossbow was great I didn't have a problem with it. The HUGE problem was the string you have to get the string made for it or else it won't work. The string made for this doesn't work very well at all. I could use it for a couple hours and at the end of that time the string would be falling apart (lots of loose strings hanging off). Very accurate, easy to set up and the self cocking works great. The rear sight could be improved but this is a great buy.